Tangrams are a set of seven different shapes. Among these seven shapes, are five triangles, a square and a parallelogram. Among the triangles, there are two large triangles, one medium triangle and two small triangles. Each of the triangles is a right triangle. To help students understand the basic flat shapes and their various geometric combination. This set is provide with combination of 6 flat shape in a reusable box. Use this set of 250 blocks, in six shapes and six colors, to explore patterns, symmetry, linear and area measurement, fractions and problem solving. 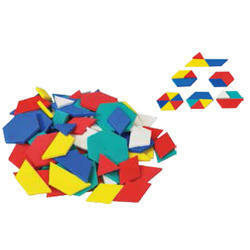 These Pattern Blocks consist of 25 hexagons, 25 squares, 50 equilateral triangles, 50 trapezoids, 50 rhombuses, and 50 rhombuses. 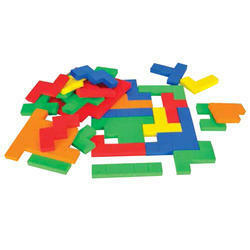 Children will enjoy discovering and developing a positive dimension to learning with these manipulative.Made up of foam. Pentominoes is puzzle game this structures consisting of five identical squares connected by their sides.. In the pentominoes puzzle game, players must rotate the shapes and fit them into a grid so the shapes interlock and the finished grid has no empty spaces. Pentominoes lend themselves well to a wide range of classroom activities, from illustrating mathematical concepts to geometrical puzzles. We are the manufacturer of Pattern Block (Plastic). Use this set of 250 blocks, in six shapes and six colors, to explore patterns, symmetry, linear and area measurement, fraction and problem solving. These Pattern Block consist of 25 Hexagons, 25 squares, 50 equilateral triangles, 50 trapezoids, 50 rhombuses big, and 50 rhombuses small. 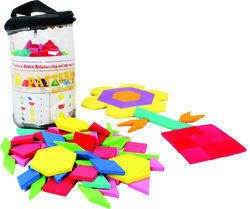 Children will enjoy discovering and developing a positive dimension to learning with these manipulative. To understand & develop the skills of making complex mathematical pattern by using 3 different dimension right angle triangle with assorted colors. Use these sets of 144 blocks, in six shapes and six colours, to explore patterns, symmetry, linear and area measurement, fractions and problem-solving. We are leading Manufacturer of Fraction From Pattern Block and our product is made up of good quality. 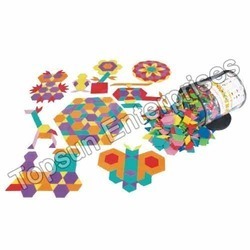 We are leading Manufacturer of Tessellation Kit and our product is made up of good quality. 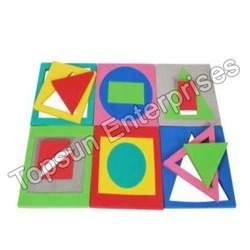 We are the manufacturer of Pattern Making Triangle. 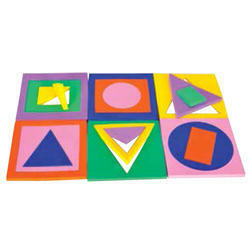 This set consists of right triangles of 3 different dimension and 3 different colours too. This resource can be used to understand and develop the skills of combining triangles to make different shapes, exploring patterns and tessellations. 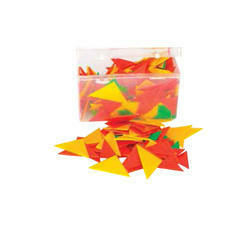 We are the manufacturer of Tangram. 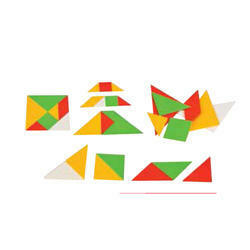 Tangram are a set of seven different shapes. Among these seven shapes are five triangles, a square and a parallelogram. Among the triangle, there are two large triangles, one medium triangle, and two small triangles. Each of the triangles is a right triangle. Set of 7 Pcs. of Tangram in 4 Colours. Total 28 Pcs. We are the manufacturer of Pattern Block (Student Set). We are the manufacturer of Sit & Set. 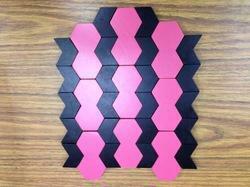 We are the manufacturer of Fraction Pattern Blocks. 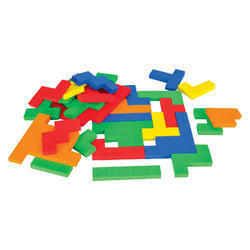 We are the manufacturer of Pentominoes. Pentominoes is a famous puzzle, that are made from 5 identical squares, fixed together at their edges. There are at least five good reasons to incorporate pentominoes in the classroom. Pentominoes nurture a non-anxious attitude toward mathematics and science, promote an atmosphere of cooperation, support development of the problem-solving process, provide spatialability skill exercises, and introduce children to elementary number theory. In the pentominoes puzzle game, players must rotate and fit them into a grid so the shapes interlock and the finished grid has no empty space. Pentominoes can also be used to examine the concepts of congruence, similarity, transformations (flips, turns, slides), tessellations, perimeter, area etc. 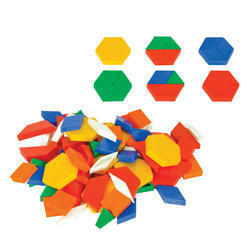 We are the manufacturer of Tangram Plastic. 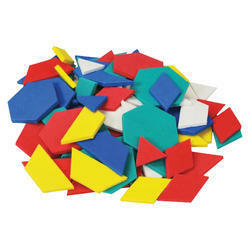 We are the manufacturer of Magnetic Tangram. The Symmetry kit stimulates the child’s imagination and allow them to explore symmetry and reflection with their creative designs. They will also want to look through the mirrors and see their own multi image reflection. 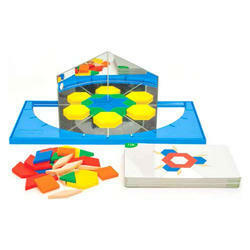 Set includes 3 vertical acrylic mirrors, one semi-circular horizontal acrylic mirror, wooden frame with degree graduation, 30 pattern blocks, and 64 × 2 activity cards.